The global almond industry is growing. Almonds are the most consumed tree nuts in the world, with 1.2 metric tons produced during 2017 – 2018. While production is limited geographically to North America (81 per cent of global yield), Australia and Southern Europe, India, China and Vietnam are among the worlds biggest almond consumers. Demand for almonds is being fueled by several factors. As economies such as China grow, so does their appetite for western foods. Global trends also bear significance. As more people seek alternatives to meat and dairy for health, ethical or environmental reasons, the nut-as-meat protein replacements and nut milk markets are seeing massive growth. Almonds are also a key ingredient in many healthy snacks, because they are hailed as a nutritionally dense, ‘super food’. While this growth is of course welcome to almond producers, it carries challenges. How do producers increase their yield while keeping costs under control and still ensuring top quality product? What about increasingly erratic global weather patterns? As the saying goes, ‘necessity is the mother of invention’ and the almond industry is certainly tackling the challenges it faces with some exciting innovation. Here we look at the five main challenges faced by the global almond industry today and how producers are overcoming them. To be competitive today, almond farmers need more from their land and their crop. Higher levels of production require more intensive farming, but traditional methods are very difficult to scale cost-effectively and sustainably. In order to be competitive, almond producers are increasingly adopting the first model, having identified a pressing need for both a scientific approach to planting and automated management. Automated processes are more reliable than workers for repetitive tasks. Once the technology is set up, it can also significantly reduce management costs. In Spain, farmers are both extending their orchards by replacing wheat and sunflower fields with almond trees in a very organised way, and finding new uses for technology. Their ‘shaker’ machines, for example, usually used to harvest olives, are now being used to harvest almonds as well. Spanish farmers are also looking at different varieties of almond tree that could potentially deliver a greater yield. However, there may be implications with these varieties, such as the amount of water required to grow them, which also have to be taken into account. California, the world’s almond growing capital, is suffering record-breaking wildfires and droughts. Limited to underground aquifers shared between commercial enterprise and residents, California leads the way with efficient irrigation. This has led to them developing cutting edge irrigation solutions that other countries are also learning from. 87 per cent of Californian farmers use micro-irrigation – where water is delivered directly to tree roots – and demand-based irrigation scheduling. Improvements such as these have reduced the amount of water to grow 1lb of almonds by 33 per cent over the past 20 years. Drought is a problem in Spain too, with local water boards limiting the amount of water each farmer can use per hectare of land. If reservoir levels deplete, it will become imperative for Spanish farmers to address other forms of irrigation, perhaps widely adopting the Californian model. Labor is more expensive and less reliable than ever. Employment trends are changing across the world and, as developing economies emerge, manual labor becomes scarcer. Farming is losing out to more lucrative, less physical roles in other sectors. This leaves farmers suffering with a dwindling workforce, traditionally charged with quality inspection and rework: both essential in ensuring quality and yield. This issue has driven the need for better automated processes and almond producers are seeing an upsurge in profits as a result. Certain Spanish almond producers, for instance, are using reverse sorting technology to save kilos of almonds every day from the waste pile. One producer has reported a saving of 500 kilos daily, equating to €2,500 per day. Automated grading processes significantly improve consistency of quality. Human inspectors can be subjective when it comes to grading, whereas automated grading is completely objective. Despite the best efforts of almond producers to increase supply, demand continues to gallop ahead at a faster rate. Climate issues and other natural threats degrade the overall quality of the crop. Add to this increased quality control at point of import and the strains on manufacturers is obvious. While demand soars, the need for ensuring top quality product is not only in response to certain markets’ preference for premium product, it’s also a public health issue. Pathogens such as aflatoxin, salmonella and e-coli are a serious concern, reflected in the high rate of nut batch rejections in Europe. To combat dangers such as these, the Global Food Safety Initiative (GFSI) actively supports the continuous improvement of food safety for consumers worldwide. Read more: NEW CONCERNS ABOUT AFLATOXINS IN FOODS CAN BE ADDRESSED WITH STATE-OF-THE-ART TECHNOLOGIES. GFSI is a business-drive initiative that provides a platform for collaboration between some of the world’s leading food safety experts from retailer, manufacturer and food service companies, service providers associated with the food supply chain, international organisations, academia and government. Collaboration on this scale is helping drive the development of increasingly sophisticated technologies to detect all sorts of defects, from shell damage, to serious contaminations that could impact public health. Good news for consumers and almond producers alike. Finally, there are market pressures that almond producers can’t control. In 2018, US farmers saw the price of their crop drop 14 per cent between March and July. Chinese and Indian buyers shunned Californian almonds, turning instead to Australian producers, in retaliation to rising import tariffs as a result of Trump’s trade war with China. 2018 was a bumper year for California’s almond growers, many of whom were expecting to export to the lucrative Chinese market, a market the US almond industry has been developing for 15 years. It remains to be seen how this particular challenge will be overcome. While global politics can provide the toughest challenges for businesses, technology has the answers to many issues. 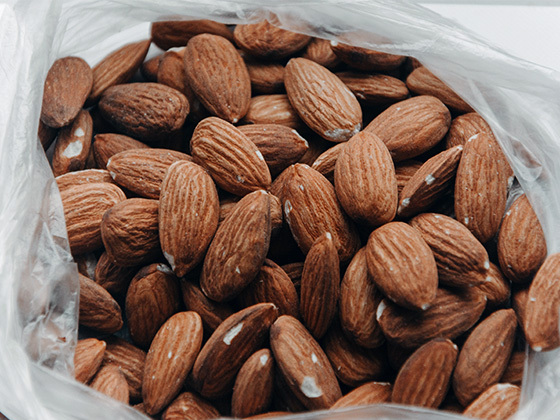 As the almond market shifts and challenges evolve, technology is offering more ways to improve efficiency, maintain uptime and increase yield. Continued success depends on an agile approach to production because it’s not a question of if businesses will be affected by these challenges, but when.